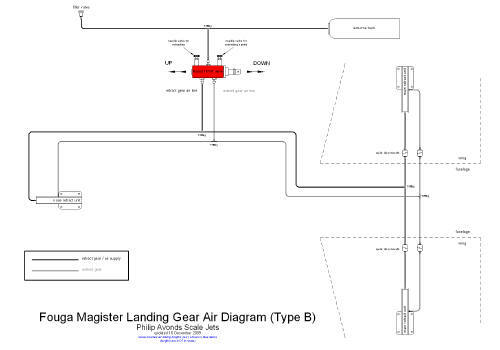 Our Fouga Magister kit is aimed at the market of scale enthousiasts and scale competitors, so we expect that the majority of our customers want a true scale functioning landing gear with the doors working like on the full size. 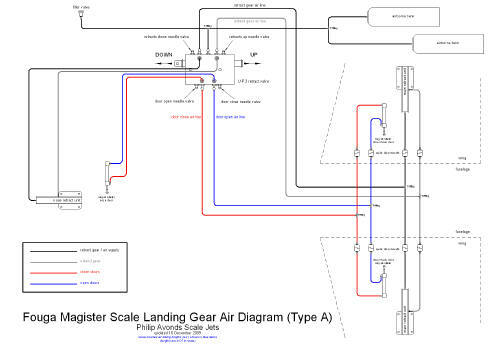 However, there may be reasons for wanting a more simple set up and that's why we offer the choice of 2 landing gear solutions: the base is the precision scale gear with custom made retract units (PA604) and a set of scale oleo struts (PA605) which can be enhanced with the sequencing gear doors and pneumatic support set (PA608A) and a 3D printed scale detailing set (PA620). 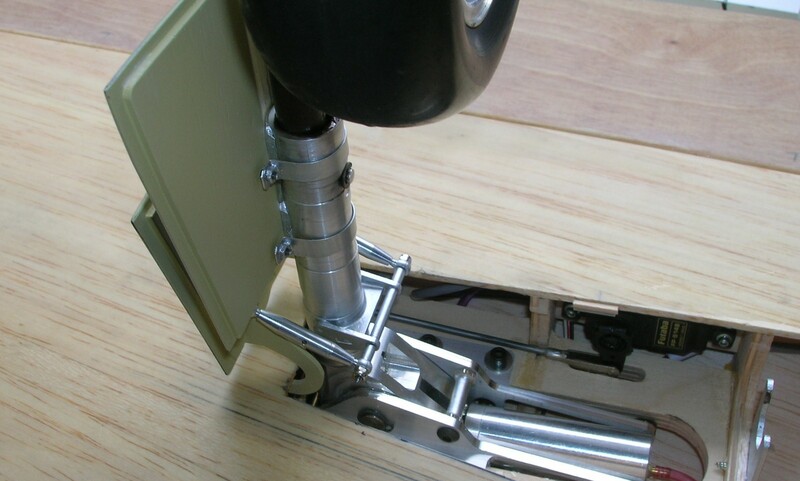 If no gear doors are desired, the landing gear can be operated with a simple pneumatic support set (PA608B). This set consist of two main gear retract units, one nose retract unit and the tail wheel bracket. The custom retract units are a drop in fit: the CNC routed retract bearers exactly match the retract mounting flanges and holes. 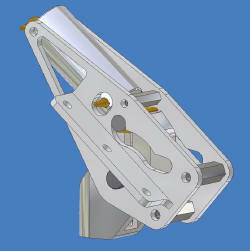 Our retracts are heavy duty and are larger than what you would normally expect on this size of model. Experience has shown that the landing gear is often put to the test and these retracts are definitely up to the task! The retract units utilize some parts which are manufactured for us by Robart (air cylinder, cam pin and followers), while we produce our own retract frames and trunions and do the final fitting, assembly and testing. 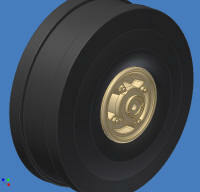 Be advised that retracts from other manufacturers will NOT fit! Our custom retract units have unique retract angles and offset geometry which is not available in any off the shelf retract unit. The nose retract unit is to be mounted at an angle due to space restrictions in the nose. A special custom trunion allows normal retract and extension angles. 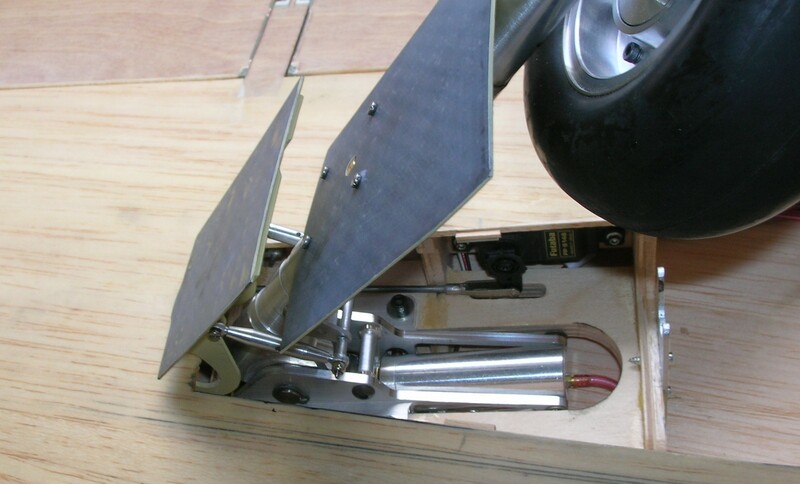 The nose wheel steering servo is attached to the trunion and retracts together with the strut, so no problems of loose cables or nose wheel jamming during extension. 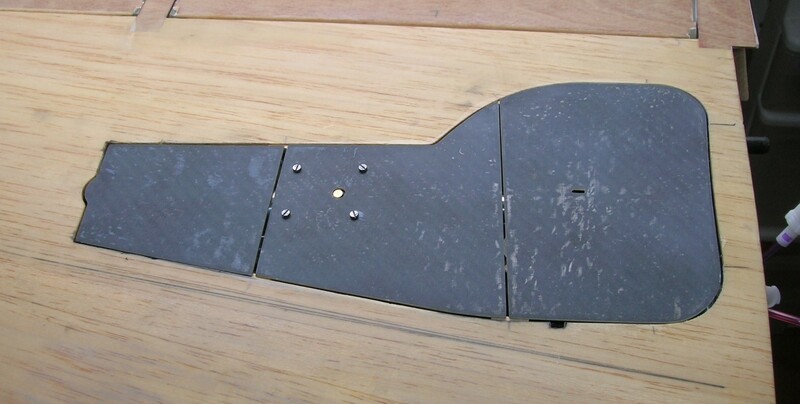 The set also contains the bracket to mount the tail wheel. The tail wheel serves to protect the ventral fin on the ground at high angles of attack (during roll out of landing for instance). This set consists of 2 main struts and 1 nose strut. Each strut has an oleo action. We have carefully selected the springs to provide excellent shock absorption during take off and landings. In combination with the wide gear track (over 800 mm), this results in exceptional good ground handling characteristics. The main struts are straight oleo struts, custom made to our specifications to reflect the true scale geometry. They are equipped with two rather soft springs allowing super smooth landings. However, before the strut reaches the end of it's travel, an additional hard spring comes into action. The nose strut is a trailing link oleo strut and is true to scale, both in geometry and in looks. All angles are reproduced as on the full size. This set with aluminium main wheels and tyres, nose wheel and tyre, tail wheel and tyre and brakes system for the main wheels is specially engineered for our Fouga Magister kits. A complete separate (from the retracts) air system is used. A leak in the brake system tends to happen more often than in the retract system. With this separate air system, the retracts are not affected and it's always better to land without brakes than without landing gear! Note: the brake hubs are manufactured by Bob Violett Models (BVM) in the USA and are patented. We then adapt the BVM brake hubs to fit our scale struts and to allow the fitting of the scale brake hub covers of set PA620. We don’t think a proportional brake valve is needed to actuate the brakes, on the contrary. We prefer to use an "all or nothing" air micro switch valve and a predetermined pressure in the separate air tank to obtain maximum effective braking action without locking up the wheels. This way, we can adjust the servo actuating the valve to get maximum braking action with a very small amount of "down" elevator stick travel. This also avoids "lifting" of the tail due to excessive "down". 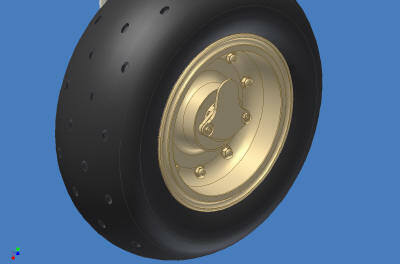 Even better is to use a separate function for the wheel brakes. 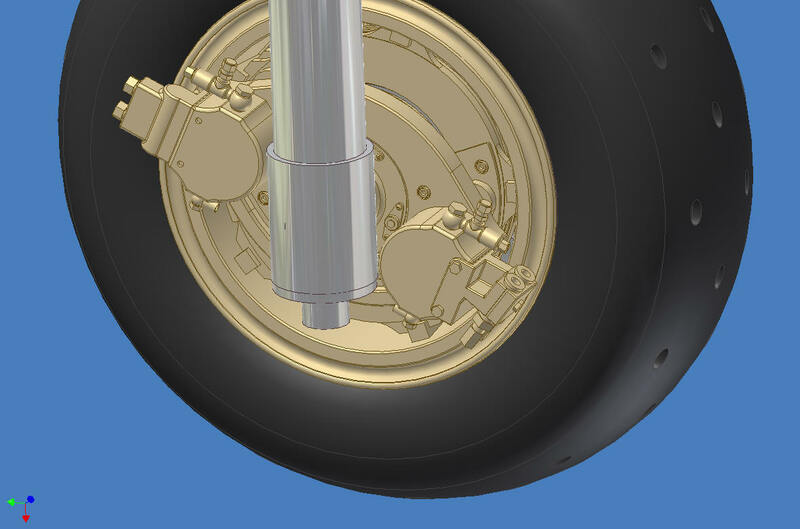 The tyres have the correct scale shape, this is especially an achievement on the nose wheel because of the special profile (to reduce water spray ingestion) and the very small hub diameter. The contents of the brakes system set with pneumatic support are shown below. The set PA620 contains scale hub covers for the main, nose and tail wheels and scale details for the nose strut. It also contains details for the cockpit interior, a full description of the set can be found here. This set contains the carbon reinforced epoxy fibreglass gear doors, the gear door hinges and hardware, the gear door actuating cylinders, the sequencing valve and all the pneumatic accessories to operate the landing gear and the doors. 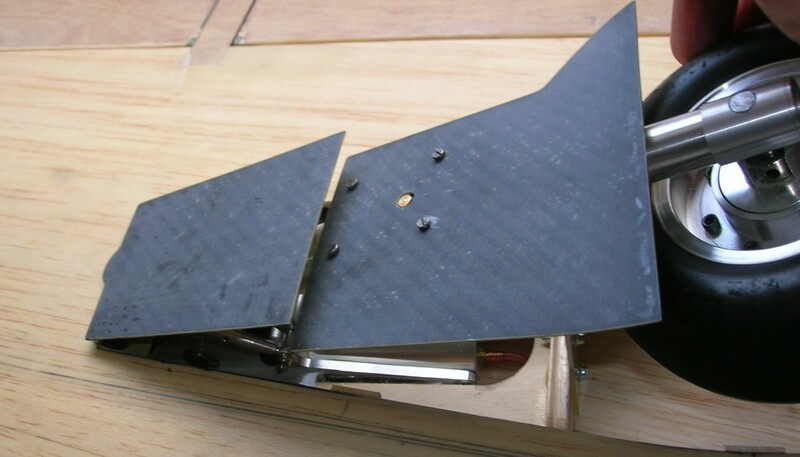 It also contains the balsa scale main gear door liners. Main gear doors: each main gear is covered by three gear doors when retracted. The outer door pivots about an offset hinge line and is actuated by the strut through links (adjustable turnbuckles). The middle door is fixed to the strut and the inner door is actuated by an air cylinder (commanded from the sequencing valve). When the gear is commanded to the up position, both the outer and middle doors follow the strut. Once the strut is up and locked, the inner door is then commanded to close. See pictures of the sequence further below. 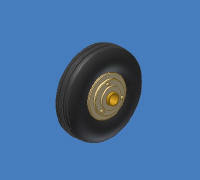 Nose gear door: the nose gear is covered by a single large door when retracted. This large door however has a small auxiliary door attached to it. 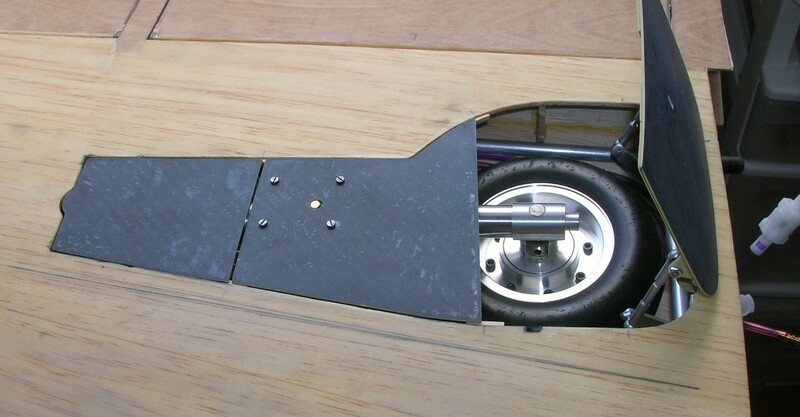 This small door opens further to clear the nose wheel when the aircraft turns sharp to the right. Both the large and small sections of the nose gear door are actuated to the correct angles by a single air cylinder through an ingenious system. After the gear is commanded to the up position and when the strut is up and locked, the nose door is commanded to close. The small auxiliary door automatically closes too. The gear doors are made in a such a way that they are easily removable. This is a useful feature when flying from rough grass fields. The system is controlled by a precision sequencing valve made by Ultra Precision. 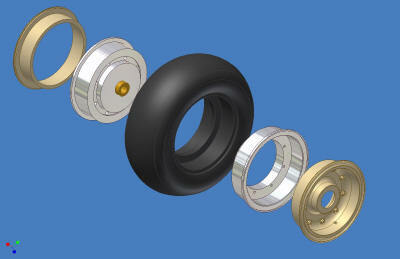 This set contains the pneumatic support set to operate the retracts only, so without any gear doors.